Khor Hui Yi of A-Level, Hannah Reshma Jambunathan and Gates Tan @ Tan Qin Ee of the Canadian International Matriculation Programme (CIMP) at Sunway College together with Na Khai Yee who is currently in Year 11 at Sunway International School were announced winners of the Harvard Prize Book Award recently. This is the first time the award is extended to Sunway International School Year 11 students. 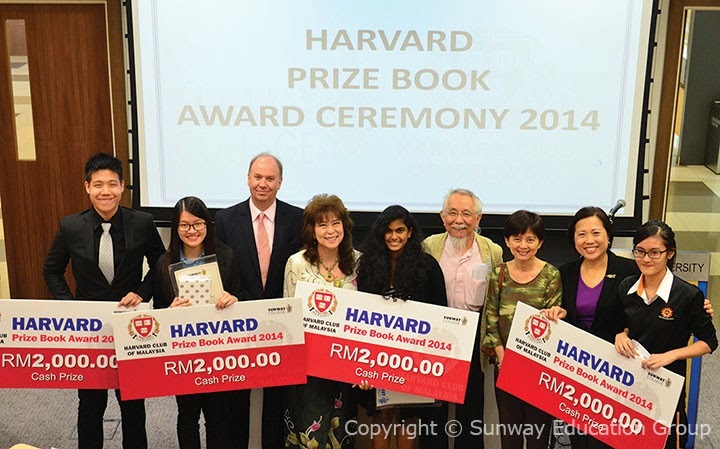 The winners each received RM 2,000 cash prize, a copy of the Harvard Prize Book, an opportunity for internship in the Harvard Club of Malaysia throughout the duration of study at Sunway College and a certificate endorsed by the Harvard Club of Malaysia. The 4 winners were selected from 13 finalists who are full-time students of Pre-University programmes of Sunway College and Year 11 students of Sunway International School who have completed at least one semester of study and are continuing students. The winners were chosen after a stringent selection process. Asides from having a consistent track record for their academic achievement with an average of 90%, the candidates also had to demonstrate exceptional contribution and engagement in community service. The students were assessed by a panel of judges from the Harvard Club of Malaysia based on an interview covering social, intellectual and ethical aspects. Also present at the Harvard Prize Book Award Ceremony was Tan Sri Dato Dr Lin See Yan, President of the Harvard Club of Malaysia who spoke to the students on Harvard, American Education and the British Education.